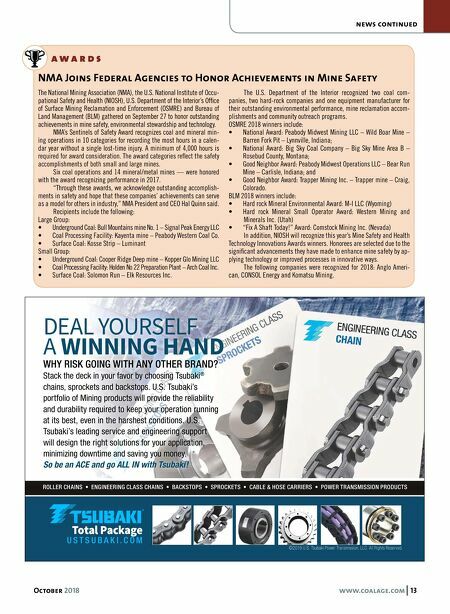 ROLLER CHAINS • ENGINEERING CLASS CHAINS • CAM CLUTCHES • SPROCKETS • CABLE & HOSE CARRIERS • PT COMPONENTS October 2018 www.coalage.com 13 news continued NMA Joins Federal Agencies to Honor Achievements in Mine Safety The National Mining Association (NMA), the U.S. National Institute of Occu- pational Safety and Health (NIOSH), U.S. Department of the Interior's Office of Surface Mining Reclamation and Enforcement (OSMRE) and Bureau of Land Management (BLM) gathered on September 27 to honor outstanding achievements in mine safety, environmental stewardship and technology. NMA's Sentinels of Safety Award recognizes coal and mineral min- ing operations in 10 categories for recording the most hours in a calen- dar year without a single lost-time injury. A minimum of 4,000 hours is required for award consideration. The award categories reflect the safety accomplishments of both small and large mines. Six coal operations and 14 mineral/metal mines — were honored with the award recognizing performance in 2017. 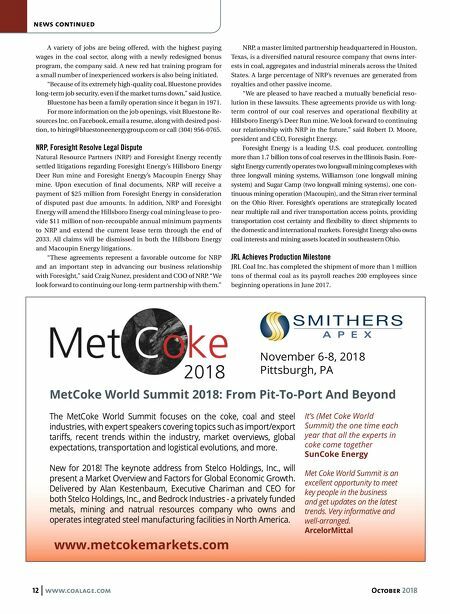 "Through these awards, we acknowledge outstanding accomplish- ments in safety and hope that these companies' achievements can serve as a model for others in industry," NMA President and CEO Hal Quinn said. Recipients include the following: Large Group: • Underground Coal: Bull Mountains mine No. 1 – Signal Peak Energy LLC • Coal Processing Facility: Kayenta mine – Peabody Western Coal Co. • Surface Coal: Kosse Strip – Luminant Small Group: • Underground Coal: Cooper Ridge Deep mine – Kopper Glo Mining LLC • Coal Processing Facility: Holden No 22 Preparation Plant – Arch Coal Inc. • Surface Coal: Solomon Run – Elk Resources Inc. The U.S. Department of the Interior recognized two coal com- panies, two hard-rock companies and one equipment manufacturer for their outstanding environmental performance, mine reclamation accom- plishments and community outreach programs. OSMRE 2018 winners include: • National Award: Peabody Midwest Mining LLC – Wild Boar Mine – Barren Fork Pit – Lynnville, Indiana; • National Award: Big Sky Coal Company – Big Sky Mine Area B – Rosebud County, Montana; • Good Neighbor Award: Peabody Midwest Operations LLC – Bear Run Mine – Carlisle, Indiana; and • Good Neighbor Award: Trapper Mining Inc. – Trapper mine – Craig, Colorado. BLM 2018 winners include: • Hard rock Mineral Environmental Award: M-I LLC (Wyoming) • Hard rock Mineral Small Operator Award: Western Mining and Minerals Inc. (Utah) • "Fix A Shaft Today!" Award: Comstock Mining Inc. (Nevada) In addition, NIOSH will recognize this year's Mine Safety and Health Technology Innovations Awards winners. Honorees are selected due to the significant advancements they have made to enhance mine safety by ap- plying technology or improved processes in innovative ways. The following companies were recognized for 2018: Anglo Ameri- can, CONSOL Energy and Komatsu Mining. % a w a r d s ROLLER CHAINS • ENGINEERING CLASS CHAINS • BACKSTOPS • SPROCKETS • CABLE & HOSE CARRIERS • POWER TRANSMISSION PRODUCTS ® U S T S U B A K I . C O M Total Package WHY RISK GOING WITH ANY OTHER BRAND? Stack the deck in your favor by choosing Tsubaki ® chains, sprockets and backstops. U.S. Tsubaki's portfolio of Mining products will provide the reliability and durability required to keep your operation running at its best, even in the harshest conditions. U.S. Tsubaki's leading service and engineering support will design the right solutions for your application, minimizing downtime and saving you money. So be an ACE and go ALL IN with Tsubaki ® ! DEAL YOURSELF A WINNING HAND ©2018 U.S. Tsubaki Power Transmission, LLC All Rights Reserved.